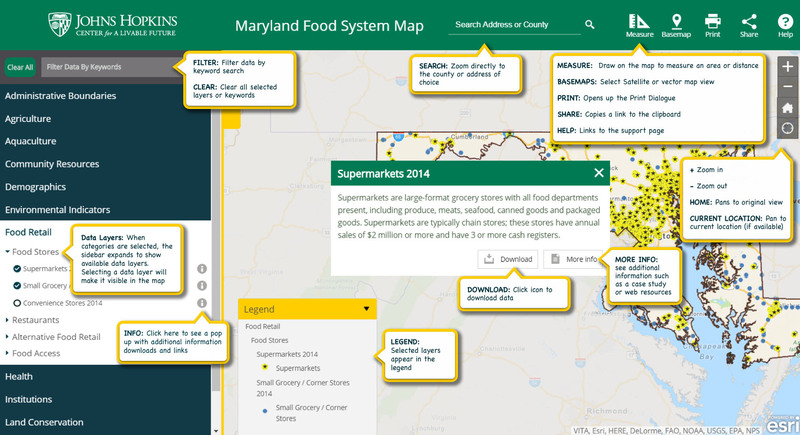 Welcome to the Maryland Food System Map! We combine an interactive mapping platform with data on the food system, the environment, and public health. Read on to learn more about using these resources. Explore more than 175 data layers on the Maryland Food System Map. Capabilities and features of the application include the ability to create and print unique maps, search for locations and filter data, measure distance and area, and share the exact map that you create through a unique URL. Users can turn on data layers, find definitions, links to downloads and learn more about food systems topics, zoom to a point of interest and click on data points to see all information tied to the feature. Click here to for a brief summary of the features on the Maryland Food System Map. Easily find all data available on the Maryland Food System Map on our ArcGIS Open Data site. This site features an entry for each data layer that includes the definition, data source, year of update and options for download and sharing. All data are publically available for download—as an entire dataset or filtered subset—in a variety of spatial and non-spatial formats. Users can also use this site to visualize the data as web maps, charts and graphs and share data on websites, social media and more. The Open Data site is also accessible through clicking on individual data layers on the map. Click here to see more information from Esri on using ArcGIS Open Data.